What is it about homilies on the Woman at the Well that annoys me so much? The worst I ever heard was by a priest with horn-rimmed glasses, a creepy demeanor and an utter inability to relate to people, who said that Jesus "grew" in his encounter with the Woman at the Well. He "grew" in learning the limitations of His own judgmentalism, prejudice and sexism. This is why the reading is included in Lent, because Jesus needed Lent in order to overcome his own narrowness. You see? But a homily as bad as that is easy to spot. The more dangerous homilies are those that do damage not by what they do say, but by what they do not say. The homily I heard last Sunday, while on tour with my actress Maria, at a random parish we'd never been to before, was a good example. Of the church itself, Maria said, "This church is so modern it must have been designed by Frank Lloyd Wright." "More like Frank Lloyd Wrong," I countered. But the art and architecture were not as bad as the music, and the music was not as bad as the constant chatter and party atmosphere before Mass, and the constant chatter and party atmosphere before Mass were not as bad as the homily. And the heart of the homily was this: enthusiasm! 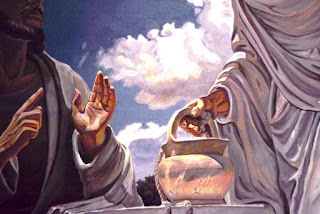 We need to leave our water jars behind and go spread the news about Jesus, as the Woman at the Well did. We won't be able to help it! When we encounter Jesus we will be so excited that we'll just have to spread the word! We won't be able to hold it in! Apparently, we'll just leave our water jar behind go and start to constantly chatter - like the people were doing before Mass started. Pardon me, but this is so much BS. And then it occurred to me: most people put their faith in BS. But if Jesus Christ is anything, He is, at the very least, the antidote to BS - the BS we feed others, the BS they feed us, and the BS we feed ourselves. But this is not the Jesus we encounter in homilies at Catholic parishes, in almost all cases. He ain't at that particular well, generally speaking. Because at your local parish, you will be told to be enthused! But the question remains: be enthused about what? Or about whom? In the Church of the Oprah, the Church of the Hallmark Channel, the Church of the Always Shape-Shifting Amoeba, we are constantly told to have faith, but we are never told what we are supposed to have faith in. In our modern religion, there is no longer an Object to our Faith. Terms have become indeterminate (and, for many bishops and theologians, deliberately so), and faith entirely subjective. Newman spoke of this nearly 200 years ago, in explaining the tendency of Christians to assess the validity of their "walk with Christ" merely by how they felt about Him, and to be complacent and fruitless simply because they had a kind of vague religious sentiment - which, they were convinced, was the end of it. Christ died, people believe, not to redeem us or reform us, and certainly not to call us to a greater and more awesome degree of maturity or completion as human beings, but to make us feel good about ourselves. Which leads to the most shameful form of idolatry: idolatry of self. They who make self instead of their Maker the great object of their contemplation will naturally exalt themselves, Newman wrote. The Woman at the Well did not just encounter a vague feeling that made her excited. She encountered God made man: a person who saw through her BS, saw past her half-lie about her so-called fifth "husband", and pierced her soul the way we sinners would later pierce His side. We are not told if she went on shacking up with the current dude or with the next one who came along, but if she did, then her "witness" to her neighbors is a witness against herself, regardless of how excited she was in the moment. But this is never mentioned from the pulpit. Repentance is hard and the cross is ugly. Enthusiasm is fun, because enthusiasm can mean whatever each individual wants it to mean. We can be fed by the sacraments at Mass - but in all other ways we are being starved. Starved and deprived of water. For the well - at least the well of self-indulgence - is running dry.